This T-Shirt says "POP'S" and possibly "finest beer" and I'm not sure what else. The t-shirt is light grey with black trim. Oddly enough, in subsequent reappearances, it appears to have lost its Logo. I’ve counted them as the same shirt, just because of the uniqueness of the black trim in both instances, but they are most likely two different shirts - so I've noted when the shirt appears with the POP'S logo and when it does not. In Skin (1x06), Sam wears it to say goodbye to Becky at the end of the episode. In Home (1x09), Sam wears it while questioning John’s former business partner and then keeps it on through the main action of the episode, only changing for the ‘morning-after’ goodbye scene at the very end. 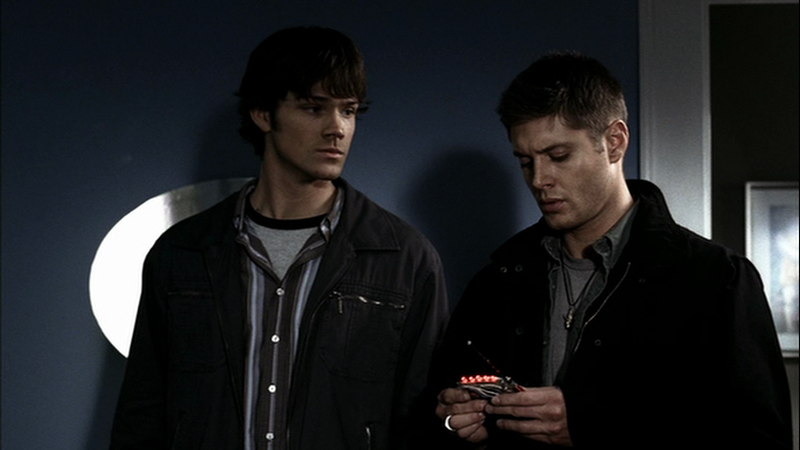 In Faith (1x12), Sam wears it underneath many layers, while researching reapers and thwarting Sue-Ann Le Grange. 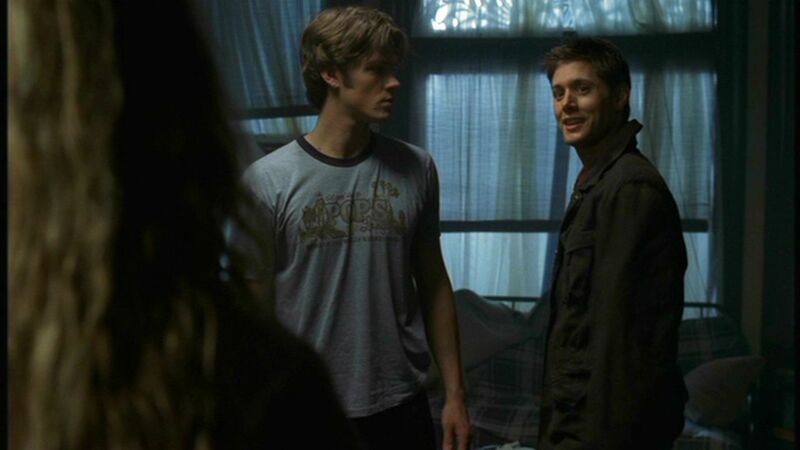 I think the one with the logo is the "Pops" shirt Sam is sleeping in in the Pilot when Dean breaks into the apartment. I always thought it was a logo for Corn Pops cereal, but I can't really tell. The other one, with no logo, might be a different shirt. It looks more gray than blue. I love the work you've done here. Amazing. Hmm, could be...I'll have to take another look at the pilot. For the project, I only started paying attention to Sam's clothes once he was on the road with Dean - so I might have missed that appearance. They probably are different shirts, but so similar in colour, that I figure I'll just treat them as one item.